This entry was posted in Choice Architecture and tagged ariely, behavioral economics, choice architect, choice architecture, choice pathway, cognitive ergonomics, consumer behavior, consumer psychology, Customer Experience, customer experience design, mental model of the customer, menu design, menu psychology, Neuroeconomics, priming, sunstein, thaler. Bookmark the permalink. 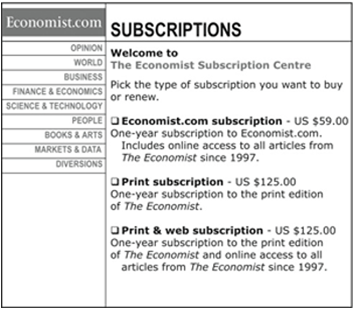 I quite liked the example with The Economist and their approach, – treating their archive as a high value item. I guess not more than 5 per cent of all subscribers would dig e-files going back as many as ten years. Thanks. Really like this article. Its all about helping customers buy, interact and engage rather than making it difficult with poor processes and attitudes. Plenty for me to think about here.